Babies are such a wonderful reason to celebrate, don't you agree? So when there are two babes involved, it's double the reason to have a fabulous baby shower! When a client asked me to help plan and design a pink and blue baby shower for her daughters twins, I jumped on board! Full vendor list at the end of the post. My client wanted each baby to be represented, which presented a bit of a challenge. Things are easier to find in pink than in blue, but we were able to find an alternating tablecloth pattern that really complimented each other. We had white and pink chevron tables with blue napkins and blue tablecloths with pink and white chevron napkins. It was totes perfection! Inside the napkin was a menu card and a chocolate lollipop tucked carefully into a polka dot ribbon. Walking in, the room was a sea of blue and pink, complete with tissue poms hanging over the guest of honor's table. Poms were also used to decorate other areas that needed a pop of color. The poms sat on top of clear vases which were a great way to display them. 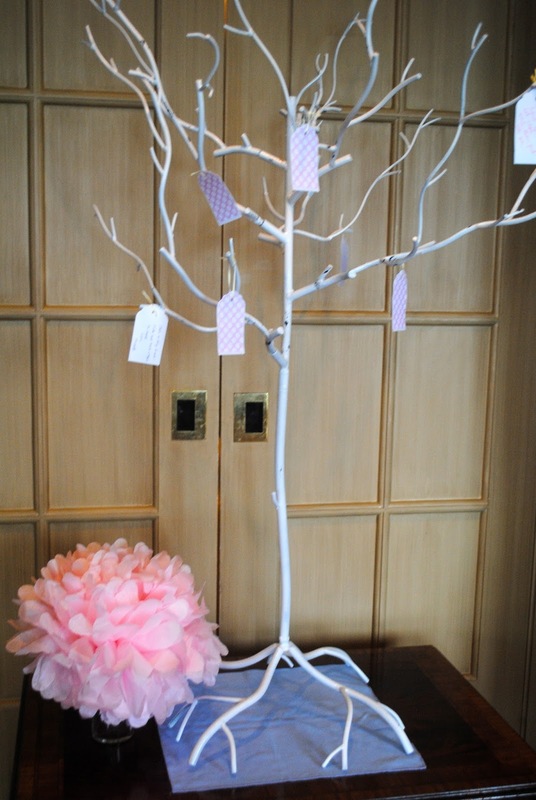 The mama-to-be's chair was highlighted with a pink and blue mini pom garland. Gorgeous pink and blue flowers decorated the tables. Flowers lined the mantel above the dessert table and seriously - they were simply amazing! Speaking of the dessert table, OMG it was perfect. There were polka dot onesie cookies. And can we talk about the onesies? The elephant with the blue and pink hearts? And I LOVE the onesies that spell out Twins! The guests went home with pink and blue taffy and custom soaps from Etsy. And they were able to give thew new mom advice with polka dot tags hanging from a wishing tree. This shower was SO much fun to plan and Myers Park Country Club was amazing to work with. I'd plan a shower like this every weekend if I could! Coming up later this week, I'm going to do a full recap of the mini-tri ... it was such a blast and I can't wait to tell you all about it! A shower valve is that part of the shower which controls the flow and mix of hot and cold water into the rest of your shower. It does this using a combination of diverters, flow controls and temperature controls.